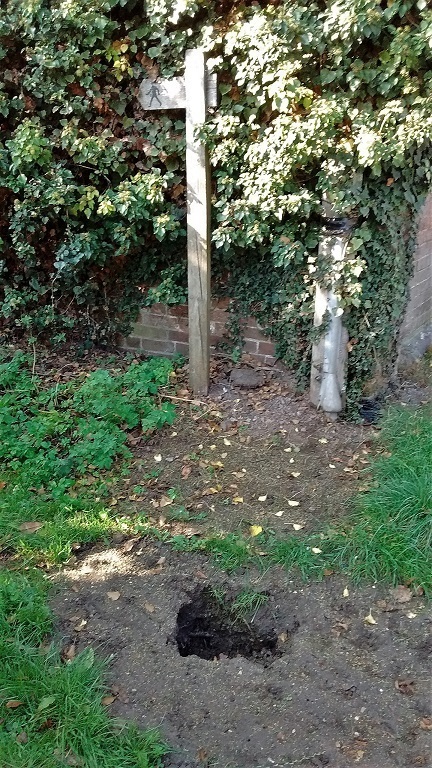 1) Monday 8th October attention was drawn to a potentially dangerous hole at the Attwood Lane end of footpath HO8. This had previously been protected by Balfour Beatty Living Places (BBLP) barriers, but they had been removed. This problem was raised with BBLP and a response was received from Manny Smith, our BBLP Locality Steward, with photographic evidence to show that the hole had been filled in on 17th September (see below right). 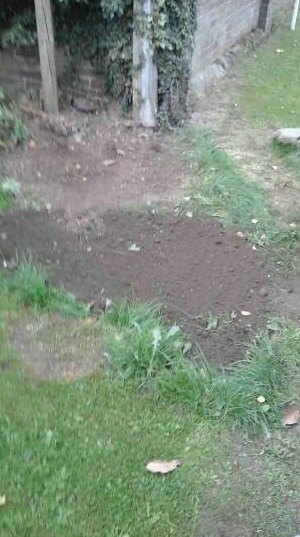 The immediate danger was removed by our Chairman who filled the hole with gravel from his garden. Many thanks for that. How the hole re-appeared is a mystery. Any information on this would be gratefully received as the hole was in a very dangerous unlit position. Hole as left by BBLP on 17th September – already filled! 2) Wednesday 10th October 4.5 miles walking/checking Holmer & Shelwick parish paths HO8, HO6, HO13, HO14, HO10 and HO8A. This included a very helpful visit to Burcott Farm to discuss options for stile replacement/repair with the farmer, Mr Hartland. 3) Wednesday 31st October 2.8 miles walking/checking Holmer & Shelwick parish paths HO1, HO8 and HO3. Path HO1, off the Roman Road by The Crescent is temporarily closed due to the Bloor Homes building works. There is supposed to be an alternative temporary path but that was not well marked or usable. Mr Phil Roper, the Site Manager of the Hereford Point site advised that within a reasonably short space of time a path will be created across the building site. This will have barriers/rails and signage to guide walkers. It will be a flexible path that will be adjusted/moved to keep pedestrians safe through the site as houses are built. Have read the Herefordshire Planning site concerning P182712/RM Application for Approval of Reserved Matters entry. 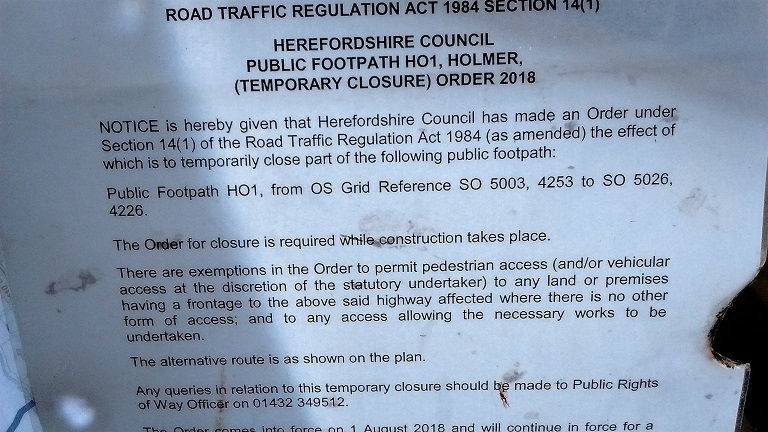 Under ‘Representations’ Herefordshire Council Economy and Place states in its input dated 23 Nov 18 that ‘HO1 is not obstructed by the development.’ Is this correct or, if it is incorrect, has some acceptable diversion of HO1 already been approved? Thank you for your comment. The intention is for the path HO1 not to be obstructed by the development. Ultimately it should follow its original course, passing through the Hereford Point development but probably as a 3 metre shared cycleway/footway. However, building works close to the path require it to be temporarily diverted for the safety of walkers. The temporary route of HO1 is currently marked by Heras fencing. That route will be moved as the building work progresses across the building site but will finish up along its original route. One area that concerns me at present is the link of HO1 with Pipe & Lyde Footpath 9 (PL9). That has become very difficult to follow at present.